Ray's Bucktown B&B Innformer: Want a beach body? It's time to "spring" into action! Want a beach body? It's time to "spring" into action! At long last! Spring is upon us! We here at Ray’s Bucktown B&B are overjoyed that there is no more snow to shovel, we can bicycle to work again, and that there are even little green buds popping up in our garden! Good-bye winter – we won’t miss you. If you’re anything like this chica, when temperatures finally hit 50 degrees, you rifled through your closets and drawers pulling out your wrinkled spring clothes that haven’t seen the light of day in months. But wait. Hold the phone. This top doesn’t fit quite like it did last summer! And this cute dress seems to have...shrunk! You mean to tell me that while I was hibernating through the Arctic Vortex with warm heavy comfort foods that I gained weight? Oh the humanity!!!! Whelp, time to get back out there and sweat off those pounds I *mysteriously* gained before summer gets here! 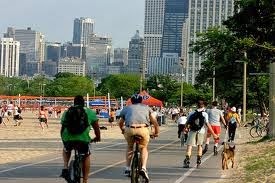 Good thing Chicago is one of the most fitness-friendly cities out there! Pretty much anything you want to do is available! Here are just a few of the many many ways to get yourself in shape this spring! Chicago Lakefront Path A favorite spot for runners, walkers, bikers and inline skaters alike. This beautiful path runs along the lakeshore from Ardmore to South Shore Drive – that’s a whopping 18.5 miles of trail! And it’s so much more than just a trail – there are volleyball courts, beaches, tennis courts and soccer fields. The path will take you past several Chicago landmarks too including the Nature Museum, Adler Planetarium, and Navy Pier. Have you always had a deep desire to be able to put your foot behind your head? If so, perhaps a calming yoga class is your forte. Moksha Yoga has several locations throughout the city, including one only 7 blocks from Ray’s B&B! And if you’re only in town for a short while, they offer 1-hour classes for only $13. Are you ready to do some serious sweating? Does your workout feel incomplete if you don’t shout at a punching bag? Push Fitness Bootcamp Cardio & Strength Training is your answer. Run by a mother-daughter duo, these ladies are sure to get your body moving! Tae bo, kickboxing, bootcamp and interval training classes will send you home with some seriously sore muscles. Maybe come on back to Ray’s Bucktown B&B and relax in the steam room! $15 for a drop-in. Can’t stop your feet from tapping when a catchy tune comes on? Maybe a dance class is more up your alley. Mixed Motion Art offers Zumba, ballet, mambo, chambo (?) and something called Shake IT! I’m not sure what it entails, but it sounds awfully fun! Single classes run from $12-$17. And finally, for the most ultimate form of exercise that has ever existed, that is also totally free, watch this video.